GIS users had lots to cheer about in 2012, with major releases of software with important new capabilities. These deliveries have also set the course ahead for what’s to come in 2013. Here’s a quick look back on the past year, with a glimpse at the year ahead. Clearly a significant release, and one of the best and most comprehensive updates in many years, the big milestone for Esri professional GIS users this year was ArcGIS 10.1, fulfilling many initiatives introduced in 2010 with ArcGIS 10.0. Beyond the new features and functions it delivered, ArcGIS was transformed, becoming a complete and unified system, with integrated online and mobile capabilities to support a variety of workflows and needs. ArcGIS for Desktop received hundreds of improvements, many focusing on advanced mapping and editing workflows, increasing efficiency, and making it easier to create and share content. ArcGIS 10.1 also advanced geographic science, with space-time clustering, grouping analysis, and spatial order correlation improving our ability to visualize patterns and trends in complex data. Also extended were the ability to integrate and exploit imagery, improvements in 3D capabilities, and ArcGIS Runtime, a new platform for developers that enables the creation of lightweight apps for easy deployment, or embed maps and extend the capabilities of existing applications. ArcGIS for Server, the primary engine for powering geospatial infrastructure, added native 64-bit support for Windows and Linux operating systems, enabling increased performance leveraging these platforms. ArcGIS for Server was also extended to support alternative deployment methods, becoming certified on VMWare and VCE’s VBlock platform, and supporting hosting in Amazon Elastic Compute Cloud in both Windows and Linux. A new application was delivered—ArcGIS Server Cloud Builder—designed to help you deploy your ArcGIS Server on Amazon Web Services site, create templates, make backups of your sites, and manage them more efficiently. There’s just too much to mention in this post, but you can review all the details in What’s New in ArcGIS 10.1. In 2012, ArcGIS Online grew from a simple platform for sharing maps to a deeply integrated and integral part of the ArcGIS system that continues to evolve rapidly and grow with new cloud-based capabilities. This year ArcGIS Online was introduced with new capabilities for organizations available via subscriptions. These have already made a difference and changed the discussion around geographic information for many early adopters. Among the cloud-based capabilities for ArcGIS Online organizations are geographic asset management, user management, and hosted map publishing services that make it easy to deliver highly available maps, support self-service capabilities, and engage others in your organization. The web map ecosystem plays a key role here. More than a map in a browser, an ArcGIS Online web map within Esri is a specification that ensures they can be used anywhere, on any device, and by everyone. This specification has also grown over the past year with new capabilities, and while many of the changes are transparent to end users, they’ve greatly expanded their utility. Coupled with easy-to-configure hosted template applications, you can solve workflow needs, reach a broader audience, and even tell compelling stories, like the many you’ll see featured on Esri’s Storytelling with Maps site, and the Storytelling with Maps community site. CityEngine Web Viewer was introduced in the September ArcGIS Online update, and provides 3D visualization capabilities of CityEngine scenes. Esri Maps for Office, released in July, was another key new part of the ArcGIS Online ecosystem and part of the Esri Location Analytics product offerings. It’s a new analysis tool that allows business professionals to visualize data by creating and sharing interactive maps directly within Microsoft Office. 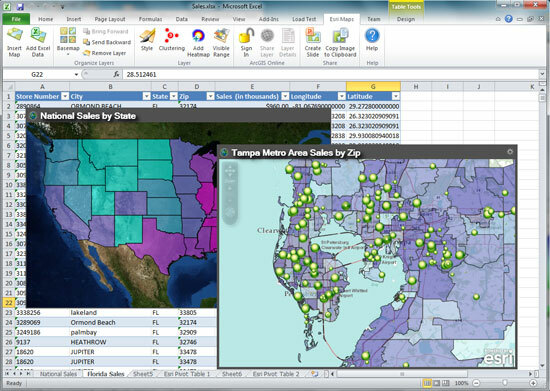 Esri Maps for Office is a downloadable add-in for Microsoft Office 2010, available to ArcGIS Online subscribers, that empowers a new segment of users within an organization with GIS maps and capabilities. And perhaps more importantly, enables them to participate and contribute to core geographic assets. ArcGIS Online’s core services also evolved throughout the year, with expansive additions to the World Imagery basemap, the World Streets basemap, and a cartographic redesign of the very popular World Topographic basemap, also known as the “Community basemap,” a result of the participation of users worldwide in it’s content. Behind the scenes new worldwide geocoders and gazetteers have been put into place, and Task services have evolved for developers. Again, there’s too much to mention here, but you can view all the details of the past year’s releases in the What’s new? ArcGIS Online help topic. Esri’s technology and expertise was supported and enhanced through several notable acquisitions this year. Location analytics developer GeoIQ was the first, joining Esri in July. Their addition strengthened Esri’s capabilities in the areas of user experience design, web development, Big Data, and cloud-based applications. Mebourne, Australia-based Maptel joined Esri in the same month. The addition of Maptel, who has been the developer for Esri’s ArcPad software for several years, will strengthen Esri’s field data collection capabilities and its overall mobile platform. In October Portland-based Geoloqi joined Esri, adding their expertise in mobile-focused, trigger-based technology to the Esri portfolio. Geoloqi’s developer platform for mobile applications, combined with ArcGIS, will create more powerful geolocation and mapping tools for the development of web and mobile applications. Esri formally established several R&D Centers across the globe, located in Beijing, Portland (Oregon), Washington D.C., and Zurich. Many of these centers are anchored around the teams acquired through acquisitions, each bringing their own expertise and vision into the Esri product development landscape. ArcIMS, once a pioneering internet mapping platform, was officially retired this year with the release of ArcGIS 10.1. While it served many users and many maps throughout its lifespan, the superior capabilities and architecture of ArcGIS for Server have now officially pushed it below the horizon in 2012. With 2012 behind us, the stage has been set for an even more exciting GIS year in 2013. We won’t reveal too many details yet, but in some ways the road ahead is easy enough to anticipate when reading between the lines of the milestones of 2012. Expect ArcGIS Online to continue to grow and evolve with respect to GIS organizations, and with the addition of GIS analytic capabilities and high-value subscription services coming in Q1, it will become even more potent – truly a full-featured cloud GIS platform. As 2013 begins you can expect the release of key solutions-focused applications. The Operations Dashboard and Collector for ArcGIS will be the first two, and will appear in January. And so will a new release of an old favorite—ArcGIS Explorer Desktop 2500—will also be delivered in January, now with deeper ArcGIS Online integration. 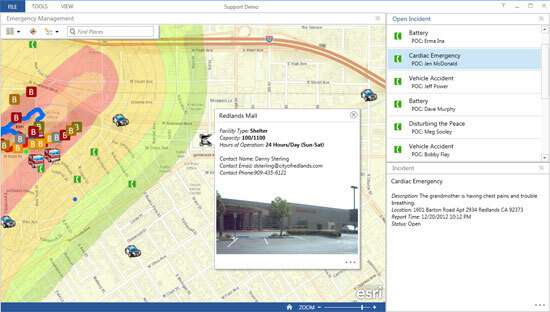 The rapidly evolving landscape of easily configurable apps and solutions will get lots of attention in 2013 (they already have been internally at Esri), so you can expect to see lots of activity and new products in this area. You’ll also see a focus on 3D capabilities in mobile apps and browsers, enhanced imagery capabilities, and much, much more. Some of the upcoming conferences, like the GeoDesign Summit in January, the Esri Federal GIS Conference in February, and the Esri Developer Summit in March, are great opportunities to learn more about these new projects. But there’s lots of other opportunities throughout next year if you don’t make one of these. Here’s to 2012, and here’s looking forward to 2013!